Ralph Branca is best known for throwing the pitch that resulted in Bobby Thomson’s “Shot Heard ‘Round the World,” the historic homerun that capped an incredible comeback and won the pennant for the Giants in 1951. 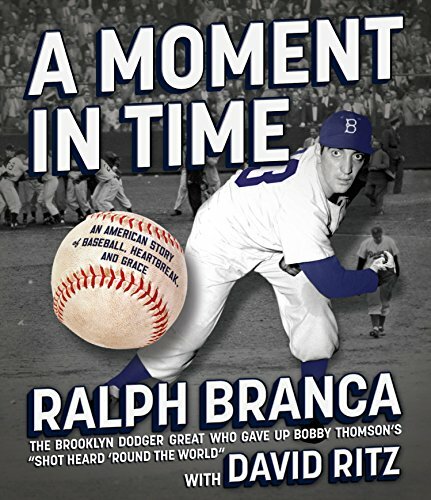 And so Branca was on the losing end of what many consider to be baseball’s most thrilling moment, but that notoriety belies a profoundly successful life and career. A Moment in Time is the remarkable story of a man who could have been destroyed by a supreme professional embarrassment—but wasn’t. Branca came up as a young phenom, playing for the Brooklyn Dodgers during their heyday. He was a staple of the Dodgers’ teams in the late 40’s, dominating the National League. New York City itself was immersed in post-war optimism, and the three teams produced passionate rivalries. It’s no stretch to say that New York baseball was the center of the sporting universe. In those days, the players were part of the fabric of the neighborhoods, of the city itself. It’s a world populated by legendary characters like Jackie Robinson, Pee Wee Reese, Gil Hodges, Leo Durocher, Branch Rickey, and Walter O’Malley. This is the world that Branca’s memoir evokes. The infamous homerun is, of course, still deeply ingrained in that story. Seven years ago, Joshua Prager reported in the Wall Street Journal that the Giants had cheated, illegally stolen signs, and that Bobby Thomson knew a fastball was coming on that fateful pitch. Prager’s story made international headlines and produced a bestselling book, but it wasn’t news to Ralph Branca, who found out from a teammate in 1954. Over the years, Branca has always declined to comment on the scandal, out of respect for his friendship with Thomson. He is finally ready to tell his story, which is as entertaining and inspiring as any classic baseball tale.